Even an upcoming two-weeks suspension from radio and cable television isn't stopping the firestorm over racial comments made by talk show host Don Imus. "This morning I heard someone who was unrepentant. I heard someone who continued to make jokes about it," Barbara Ciara, vice president of the National Association of Black Journalists, said on CBS News' The Early Show Tuesday. "While on one hand he was apologizing, on the other hand, he was saying he wasn't going to get into whether or not his suspension was appropriate." However, Imus said, "I think it's appropriate, and I am going to try to serve it with some dignity," on his show Tuesday. The suspension "not nearly enough. I think it is too little, too late," said Rev. Al Sharpton Tuesday morning. "I will serve my suspension and then I will try to make this right for the rest of my career ... I can't do any more than that," Imus said Tuesday. "What I did was make a stupid, idiotic mistake in a comedy context." "Imus talks to thousands if not millions of viewers every morning. He has a platform. He is not a comedian in a comedy club who talks to 50 people a night. He is someone who every day on the airways has access to people and can basically ply points of view. As a broadcaster, as a responsible broadcaster, we want to hold his feet to the fire on this," Ciara told Early Show co-anchor Harry Smith . He started the firestorm a day after the Rutgers team, which includes eight black women, lost the NCAA women's championship game to Tennessee. He was speaking with producer Bernard McGuirk and said "that's some rough girls from Rutgers. Man, they got tattoos ..."
Imus also said his staff had been trying to set up a meeting with the Rutgers players so he could apologize, but he said he didn't expect forgiveness. "I need to stand in front of them and say I'm sorry," Imus said. Members of the team and coach C. Vivian Stringer planned to speak publicly about it later Tuesday. Whether any of the players will meet with Imus, the university president says that is for each to decide for herself, reports CBS News correspondent Bianca Solorzano. Others on the Rutgers campus have already made up their minds. "You need to have some sense some type of moral sense not to say something like on the air," said student Tarik Richards. "But you think he should be fired?" asked Solorzano. "Yeah, of course," replied Richards. "They represented Rutgers in an exemplary fashion of which we're extremely proud and then he says that. Why? Why? Why?" said Rutgers president Richard McCormick. Some of Imus' colleagues came to his defense. "He's apologizing like a guy who got his first broadcasting job," said morning rival Howard Stern, now on satellite radio. "He should have said, '— you, it's a joke.'" Cable commentator Bill Maher said he appeared on Tuesday's program, despite advice he skip it. "When have I ever been careful?" he said. He also questioned whether this was the most important civil rights issue in the nation that black leaders were spending so much time on it. standards," said CBS News senior political correspondent Jeff Greenfield on Imus' show Tuesday. But he said he hopes Imus returns from the suspension. "You don't walk away from someone with whom you've had a 15-year relationship because they've done something dumb." However, former baseball star Cal Ripken Jr., who was to appear on Imus' show later this week to promote a book, has canceled his appearance, according to the Washington Times. "He has apologized," McCain said. "He said that he is deeply sorry. I'm a great believer in redemption. Whether he needs to do more in order to satisfy the concerns of people like the members of that team, that's something that's between him and them. But I have made many mistakes in my life ... and I have apologized, and most people have accepted that apology." CBS Radio, which, like CBSNews.com, is part of CBS Corporation, had no comment other than announcing the suspension. Imus could be in real danger if the outcry causes advertisers to shy away from him, said Tom Taylor, editor of the trade publication Inside Radio. Imus isn't the most popular radio talk-show host — the trade publication Talkers ranks him the 14th most influential — but his audience is heavy on the political and media elite that advertisers pay a premium to reach. Authors, journalists and politicians are frequent guests — and targets for insults. 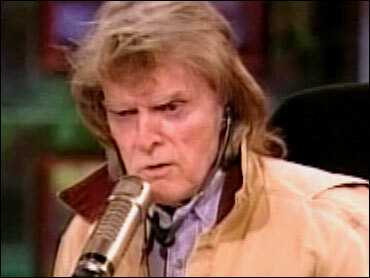 Imus' radio show originates from WFAN in New York City, also owned by CBS. The show reached an estimated 361,000 viewers on MSNBC in the first three months of the year, up 39 percent from last year. That's the best competitive position it has ever achieved against CNN (372,000 viewers). He has urged critics to recognize that his show is a comedy that spreads insults broadly. Imus or his cast have called Colin Powell a "weasel," New Mexico Gov. Bill Richardson a "fat sissy" and referred to Sen. Ben Nighthorse Campbell of Colorado, an American Indian, as "the guy from 'F Troop.'" He and his colleagues also called the New York Knicks a group of "chest-thumping pimps." Sharpton's syndicated radio program Monday, Imus said that "our agenda is to be funny and sometimes we go too far. And this time we went way too far." Imus' fate could ultimately rest with two of the nation's most prominent media executives: CBS Corp. chief Leslie Moonves and Jeff Zucker, head of NBC Universal. At one point Monday, Imus seemed incredulous at Sharpton's suggestion that he might walk away from the incident unscathed. "Unscathed?" Imus said. "How do you think I'm unscathed by this? Don't you think I'm humiliated?"